Icebreakers are one of those things people tend to dread, but actually enjoy once they are underway. Most teens are social by nature and a great icebreaker can work wonders in getting them to meet and interact with one another. A fun activity that gets teens moving around the room is a mystery box challenge. Teens move from station to station trying to determine what is in the box. Ideally, the teens will need to use their senses besides sight to make a prediction as to what is in the box. Some boxes have teens reach in and feel something gross like cooked spaghetti, others that had a strong sense of smell (small holes in the box), some which would keep shaking once they shook it (small weight suspended by a rubber band on each end). Others were more obvious like pocket change, but they had to try to guess the amount. Give them a set time limit at each station and keep them moving! Before you know it, all of the teens are laughing and interacting, setting them up for continued interaction during the Café event. Don’t forget to include the presenter in this part of the Café, as it is a great opportunity for them to interact and become comfortable with the teens and for the teens to interact with them and observe how scientists go about solving mysteries. 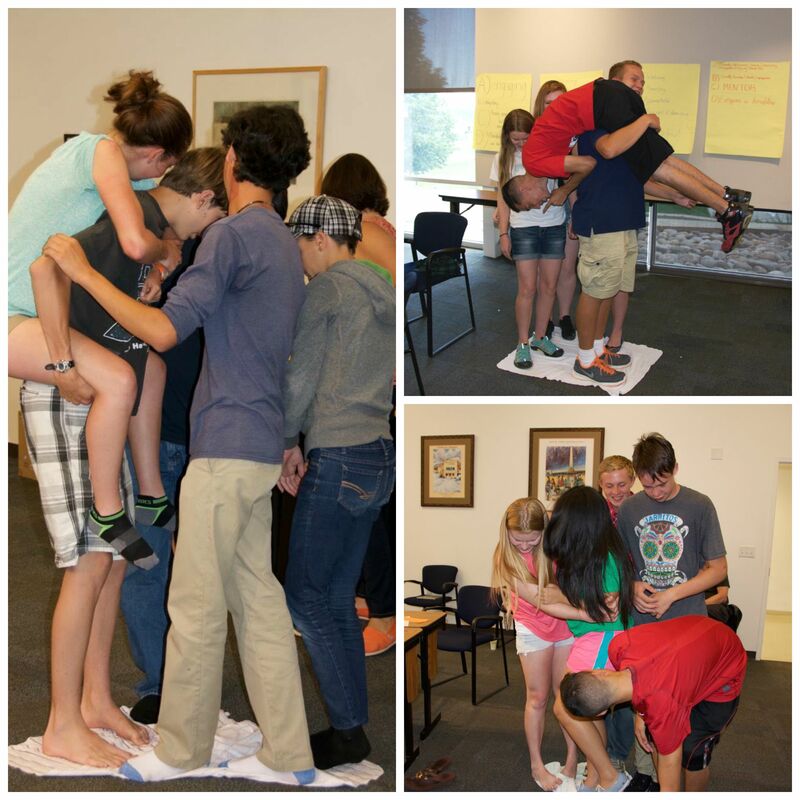 Café Scientifique New Mexico recently used several icebreakers in its annual teen leadership training workshop. For fun, we gathered several small sized baby blankets and divided the teens into groups of five. Their task was for all five teens to stand on the blanket and to flip the blanket over without stepping off the blanket. There were some very creative solutions among the teams. All of them required a lot of communication and brainstorming and resulted in a good deal of laughter! Teens get creative when space is cramped. Icebreakers help with creative thinking. Icebreaker Games – This site contains icebreaker games grouped by audience and includes small groups, large groups, adults, kids, and meetings. Some are old favorites and many are new. Icebreaker Games and Activities – This site also has games for all ages and situations. Ultimate Camp Resource – This site is aimed at camp atmospheres, but breaks their activities nicely into categories. What is your favorite icebreaker? Tell us how you are using these in your Cafés by posting to our Facebook site. Login and share your suggestions!